Corrugated paper has become one of a wide range of packaging materials used in modern packaging. 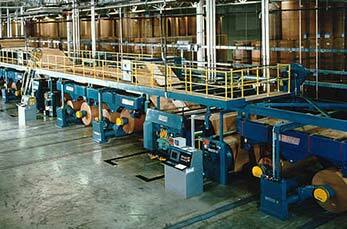 High quality of corrugated paper machine line is the basis to improve quality, increase efficiency. With 34 years experience in paper manufacture machine and paper pulp machine, Leizhan has the rich experience and customized production to meet customers` needs. Corrugated paper machine, also called fluting paper machine is to produce corrugated paper. The whole corrugated paper machine line has two components: pulping making line and paper making line. To produce living paper production line, the raw material can choose commercial wood pulp, commodity paper, waste paper and so on. Conveying raw materials by Chain Conveyor for pulping is the first step of pulp making line. Next, the waste paper will be pulped in the Drum Pulper or D Type Hydrapulper. Then, as there are mass of impurities exist in paper pulp, High Density Cleaner will be used for removing staples, stones, glassed, etc. various waste paper pulp. To screen impurities in the pulp like gravel, scrap iron, dust and large ink particles, screen devices like Pressure Screen, Vibrating Screen will help to remove it. Our whole corrugated paper production line can use commodity paper, waste paper and so on, to make lightweight, compression, puncture -resistance, shock-proof and easy processing corrugated paper.